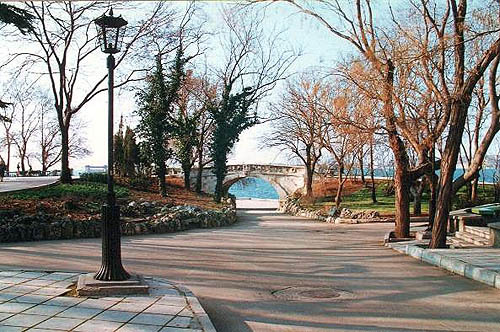 Sevastopol. It has long since been known all over the world as the city of the Russian naval glory as a firm stronghold in the South of Russia. 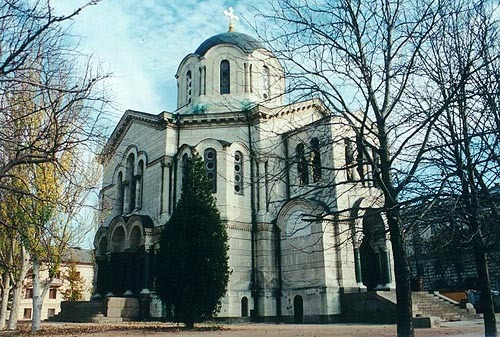 Its name which translated from the Greek means "majestic", "worthy of admiration" has been justified by the whole more than two-century-long hictory of the city. In remote times on the southern tip of the peninsula washed by the warm waters of the Black Sea there were Greek colonies that left on this land magnificent specimens of sublime Hellenic culture. 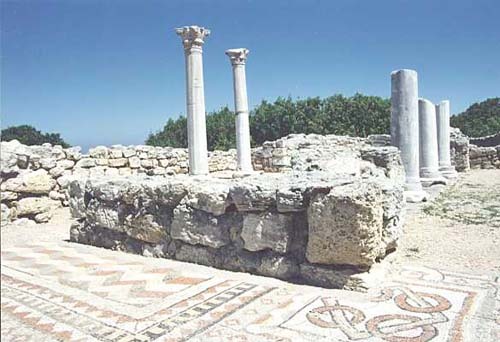 Numerous monuments of that period which have survived to this day have been gathered at the Chersonesus History and Archaeology Preserve, a museum of specific type, one of the few in the country. Centuries passed by, tribes and kingdoms replaced one another on this blessed land abounding in picturesque and convenient bays. On the shores of one of them - the Bakhtiarskaya Bay in 1787 Sevastopol arose, founded by the Russian sailors as a naval fortress with hope and firm belief that from that time on Russia's southern frontiers would be protected from the encroachments of the Empire's enemies. The history of Sevastopolco inseparably connected with that of the Black Sea Fleet was being shaped out and enriched by the feats of the Russian sailors. It was no accident that the city's and Fleet's chronicle at the earliest period had to its credit the names of the illustrious Russian naval commanders - F. F. Ushakov, M. P. Lazarev, V. A. Kornilov, P. S. Nakhimov. It was no accident either that the first monument to be set up in Sevastopol was that to military valour —the feat of the small Russian brig "Mercury". On May 14, 1829, the crew of the brig under Lieutenant-Captain A. I. Kazarsky won unexampled victory over two large well-armed Turkish ships. It was a model of heroism, adherence to the military duty, a lofty example to be followed in all times. Today Sevastopol is rightfully called a city of monuments. There are more than 1,400 of them on the legendary soil of the Black Sea sailors' capatal. They stand on hills and at their feet, on the shores of the bays, in the city's streets and squares. 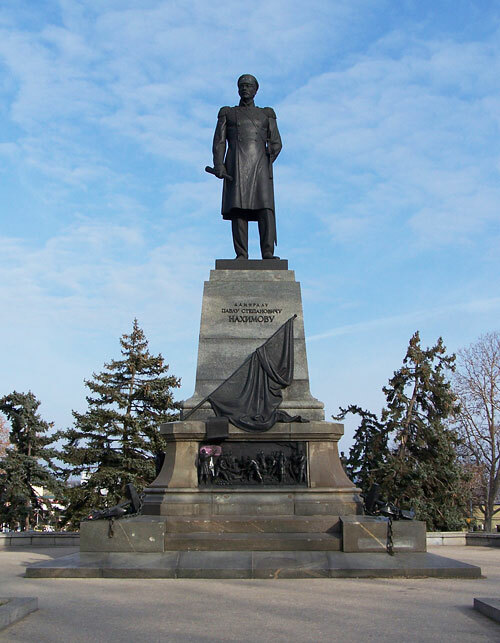 This is a chronicle in stone that has immortalized unforgettable events, momentons not only in the history of Sevastopol but in that of the whole country: the Crimean War and Defence in 1854-1855, II World War... The unexampled valour and heroism of Sevastopolites displayed in the Great Patriotic War have been commemorated by hundreds of monuments. The lines of this glorious chronicle are being written also nowadays - new obelisks and monuments are rising. The world came to know its name for the first time in the middle of the 19 century. The Anglo-French-Turkish troops having besieged Sevastopol tried for 349 days to break the resistance of its defenders. The Russian and foreign newspapers wrote with admiration that the defenders of Sevastopol both young and old had united in one impulse to hold out against the enemy attacks - a famous admiral, a sailor, a soldier - all were in the same ranks. Standing shoulder to shoulder with them were women and children. The world saw a remarkable example of mass heroism. 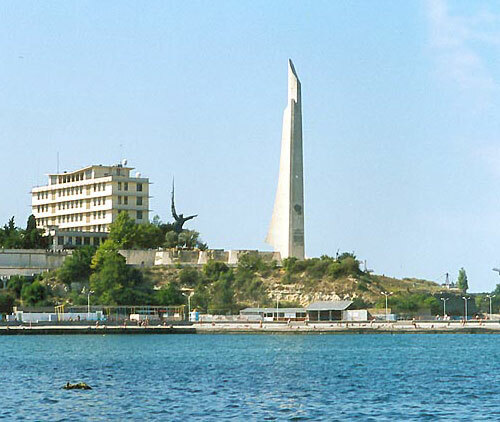 The celebrated Panorama by Franz Rubo and many other monuments created for the 50th anniversary oi the First Defence immortalized this glorious milestone in Sevastopol's history. 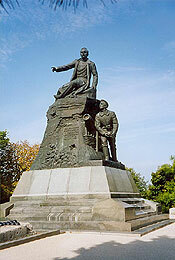 Sevastopol lived together with the whole of the country a creative life, the Black Sea Fleet gained shrength. But on June, 22, 1941, the faithbreaking assault of the Nazi Germany upset the realisation of fhe peaceful plans of the Soviet people: the Great Patriotic War broke out. The heroic defence of Sevastopol in 1941-1942 was destined to become one of the bright pages of the great battle our people fought for the honour and independance of the country, for the very existence of the Socialist system. Throughout 250 fiery days and nights the warriors of the Army and Navy, city's residents were accomplishing one uninterrupted feat containing the enemy at the approaches to Sevastopol, 300 thousand nazi men and officers were wiped out. The country has called the Black Sea fortress a hero-city, the glory of Sevastopol became actually world-wide. 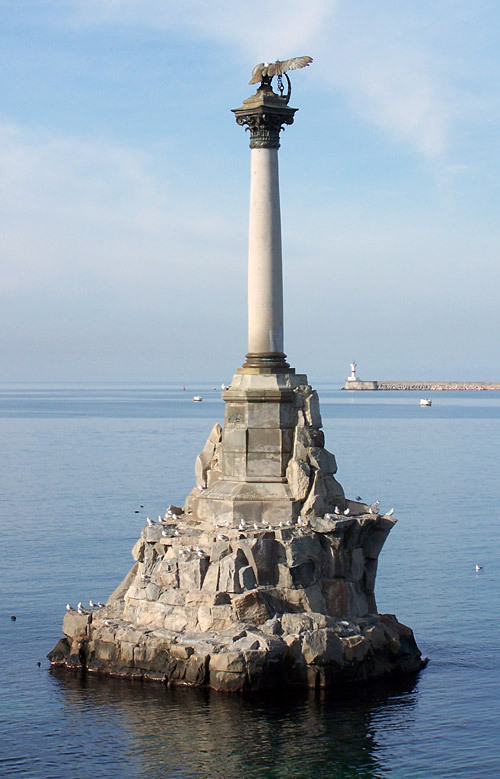 Both during the nazi occupation and in the bright hour of liberation that came in May, 1944, the Sevastopolites remained true to the motto inscribed on the city's first monument: to live up to "the example for the posterity". 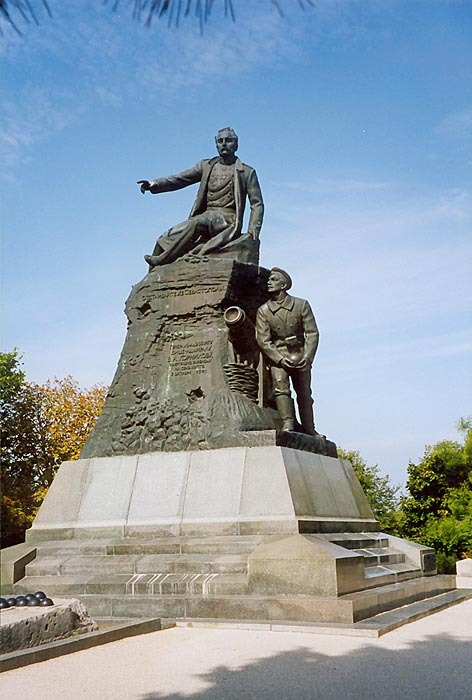 The monuments to the defenders and liberators of Sevastopol, to the partisans and underground fighters are a tribute to their feat that will endure through the ages. 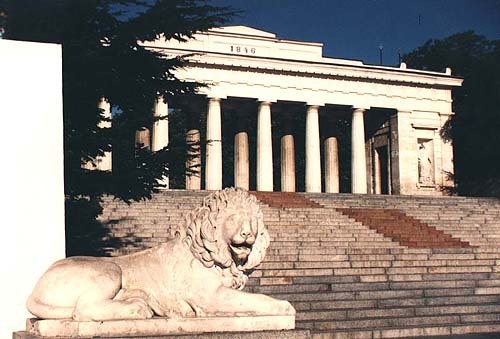 The legendary Sapun-Gora through which the way to the liberation of Sevastopol in 1944 lay has become the place of homage to the heroes. In the same year 1944 the first monuments to the Soviet warriors on this war-scorched land were erected, in 1959 the diorama showing the triumphant assault of the enemy fortifications was opened. The effort of restoration was as great as the feat of arms: the city rose from the ruins and ashes built by the Sevastopolites with the aid of the young people from all the republics of our country. 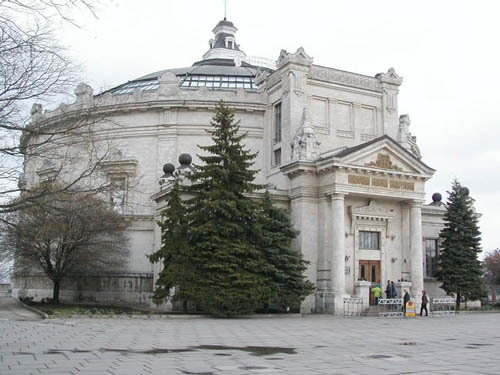 Present-day white-stoned Sevastopol has become more beautiful than it was before the war, it is a great deal larger and has- more amenities, its green attire has more luxerient. The heart of glorious Sevastopol throbs ardently and youthfully. The city lies on the Black Sea coast as a brilliant chronicle of feats, inimitably beautiful, a symbol of valour and courage. Its monuments are unfading lines of this chronicle.